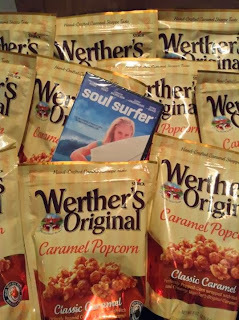 I was lucky enough to be picked to host a Werther’s Original® Caramel Popcorn “Munch ‘n Movie” MommyParty! The party kit included 12 bags of Werther’s Original® Caramel Popcorn and The Sony Pictures, family-friendly film, Soul Surfer SOUL SURFER is the inspiring true story of teen surfer Bethany Hamilton, who lost her arm in a shark attack and courageously overcame all odds to become a champion again, through her sheer determination and unwavering faith. The party kit also included many Coupons, recipes and product fact sheets. We had a blast enjoying popcorn and a movie! It was a great family night! I am glad the movie was family friendly so that all ages could enjoy it! We played games and shared the caramel popcorn. The popcorn was so good and the caramel smell hit ya as soon as the bag was open. Look how good it looks! Each guest was able to take a bag of popcorn home to enjoy at a later time! I have heard nothing but great comments about how great it tasted! I am happy that I got to be a part of this great MomParty! Receive coupons, product updates and promotions when you become a fan of our Facebook page! disclosure~ I was provided Werther's original caramel popcorn and the movie on behalf of MomParties in order to facilitate this party and review.